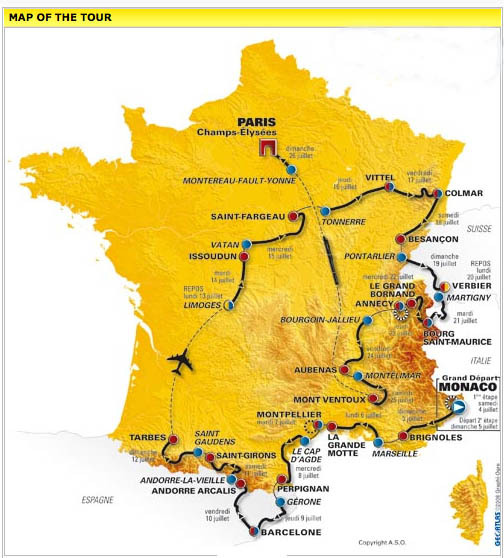 The race runs in a clockwise direction, starting in the Principality of Monaco with a time trial, then along the south coast of France, where a team trial stage has been brought back for the first time since 2005. It dips into Spain for two stages, then heads to Andorra for three stages in the Pyrenees. From there a transfer north to Limoges in the middle of France, completely bypassing the west coast, and the regions of Brittany and Normandy. The race heads east to near the German border, before starting back south and into Switzerland and Italy, then back across to France for three Alp stages, then the second and longer individual time trial in Annecy. After a transition stage, it is time for the penultimate stage - a mountain top finish on Mont Ventoux. This is the first time that a mountain finish will have been held so close to the end of the race. The next day, after a transfer by train, the tradional finish on the Champes Élysées will take place.  8 new stop-over towns - Brignoles, Girona (Spain), Issoudun, Martigny (Switzerland), Saint-Fargeau, Tonnerre, Vatan, Verbier (Switzerland). Only once, since the introduction of time trials at the revival of the Tour in 1948, has the total individual time trial distance been shorter - 52.3 km in 1967. The team time-trial has not appeared on the race programme since 2005. For the 2009 edition official times recorded at the finishing line will be included in the general individual classification and the team classification. The stage classification will be calculated according to the time achieved by the fifth rider in each team. As in 2008, no bonuses will be awarded to the first riders to cross the finishing line in intermediate sprints or stage finishes. Official time remains the absolute reference. A total of 3.2 million euros for the teams and the riders, including 450,000 euros for the winner of the overall general classification. I had a chance to have coffee with Svein Tuft today and I asked him for his thoughts on the Tour de France presentation today. "I've never really paid it attention before, but I looked at the profiles and I think I'll have a shot at making the team." Svein was particularly focused on the TT events, "The opening TT of 15km rather then a prologue suits me really well and I know I can contribute in the Team Time Trial, and the last one is 40 km rather then the usual long one. It's perfect for me if I have the form." Svein is off early next month to participate at the Ruta Conquistador in Costa Rica. " The organizer invited me down and I am still feeling like I want to race the bike. This ought to be a fun way to stay sharp before the first Team Garmin training camp in Boulder (Colorado) in mid November. "The team is going to set me up on the TT bike in the wind tunnel to see if there is any room for improvement. The position I've worked out with Bruce Wenting and Eric VandenEynde seems to work really well, but I am open to suggestions." Alberto Contador: "Just like every year, it looks like a Tour for a complete rider. The penultimate stage to the top of the Mont Ventoux is special, of course. Other years, we were used to having a time trial on that last day. I cannot complain about the time trials. The first one in Monaco is quite difficult and that suits me. The last one is not too long with its 40 kilometers. I am happy about that. Many people say that it is a Tour for climbers, but I don't agree with that assessment. There are only three uphill finishes. In the last Tour of Spain, Andorra was not so hard and I don't have the impression that Verbier will be very hard, but I will have to go see and ride them." Alain Gallopin: "It will be a very hard but interesting Tour the France. As Team Director it will be difficult to control the race and to make a strategy. Every teammate will have to be good from the first day forward. We arrive early at the Pyrenees, and then it will be a long way to the Alps. Even with this atypical Tour, the most consistent rider will win once again. It will be a nice Tour for our Team and our leaders." Johan Bruyneel: "Alberto Contador has only one big goal for 2009 and that is to win the Tour de France. It is a Tour with less kilometers in the time trial, which is good for him. Also good for him is the omission of the bonification seconds - although he did win the Vuelta on bonifications. More uphill finishes would have been better, but we'll take the three and not complain. The Ventoux at the end of the race is very special. It will provoke suspense until the very end, which is good for the race. Alberto proved in the Tour of Spain of this year that he can cope with the role of leader and favorite. He will be ready. From now on, he can already start working to reach that big goal, just like Lance Armstrong did in the past. The decision on Lance's participation in the Tour de France 2009 is for later. For the moment it is 50-50 whether he will ride the Tour. After the Tour Down Under and the Tour of California we will already know more." "The route of the 2009 Tour de France strikes me as innovative and very interesting. From its start in Monte Carlo with a 15k time trial, to the reinstatement of the team time trial, to stages in my old hometown of Girona all the way to another visit to my old friend the Ventoux, I could not have hoped for a different Tour." "While there has been a fair bit of tension and numerous disagreements with the Tour and its organizers, I am well aware that there is new leadership at ASO and I look forward to upcoming conversations and to a mutually beneficial future together. Whether it's promoting the Livestrong global cancer campaign or making the biggest bike race in the world the gem that it deserves to be, I look forward to next year. I would also like to recognize the UCI and commend them for their aggressive stance against doping, a stance that is unmatched in all of world sport." "Lastly, as to the leadership of the Astana team in 2009. It is illogical to pre-select a leader for any race in October of the previous year. We are blessed at Astana to have the strongest team in the world and I look forward to riding with all of these great riders. I have been around long enough to know that cycling is a team sport and I am fully committed to supporting the strongest rider in any race. Whether that's me, Alberto Contador, Levi Leipheimer, or Andreas Kloden."